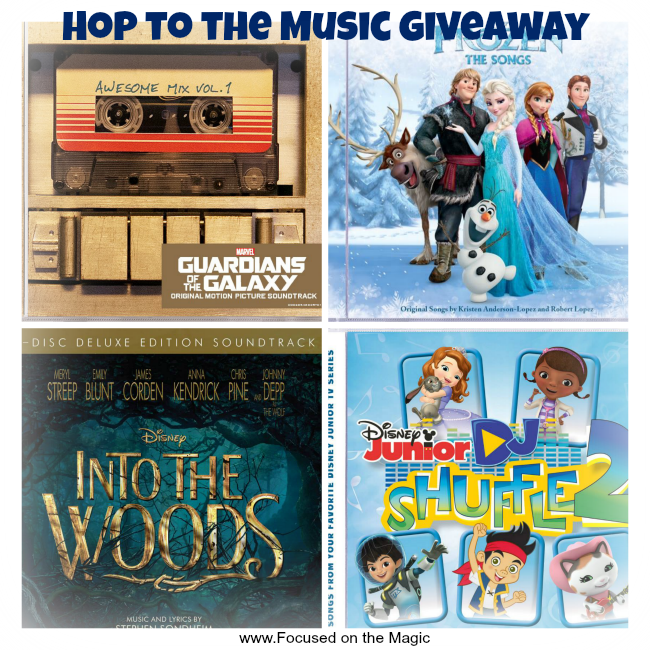 I am so excited to host this Hop to the Music Giveaway from Disney Music Group. There are 4 awesome CD titles featured and one lucky reader will receive all 4 Disney Music CDs! Easter is fast approaching! I know many of us are still looking at piles of snow but Spring has sprung and Easter is right around the corner. So, I was thrilled when I received a fabulously springy package from Disney Music with the 4 popular Disney Hop To The Music CDs inside wrapped in cellophane, colorful Easter grass and tied together with a pretty ribbon. We couldn't wait to listen to all the CDs and thoroughly enjoyed entertaining our guests at our Disney @Home Celebration. I think that theses titles would be great to include in Easter baskets, party prizes or just treat yourself. My favorite CD from the group was the Guardians of the Galaxy Awesome Mix Vol.1. I fell in love with the soundtrack when I first saw the movie, Guardians of the Galaxy. The music is a compilation of tunes from the 70's and 80's. They brought back a flood of wonderful memories for me. I'm a real retro girl so for me the music of the 70's is the best! This is an awesome album to rock out to in the car too! All of the albums would make perfect gifts and great additions to anyone's music library. They can be found at the new Disney Music Emporium along with more hit Disney albums. If you’d like to enter to win please scroll on down below! I'm so happy to let you know that one lucky Focused on the Magic reader will win ALL FOUR of the Disney Music CDs mentioned above! The winner will be chosen on April 5th! The winner will be notified by email (the one used to enter the giveaway) and will be announced here and on the Focused on the Magic Facebook page as well. If it comes to this blogger’s attention that the winner of this giveaway has won this prize on an additional blog, this blog reserves the right to choose another winner. Please allow 4-6 weeks for prize delivery.